Media captionThe BBC's Jim Muir in Beirut says activists continue to report deaths and "the repression goes on"
Syrian President Bashar al-Assad has told UN chief Ban Ki-moon that military operations against protesters have "stopped", a UN spokesman said. He was responding to a demand from Mr Ban during a phone call that "all military operations and mass arrests must cease immediately," the UN's Farhan Haq said in a statement. Mr Assad is under international pressure to end his violent crackdown. Activists say more than 20 people were killed on Wednesday alone. United Nations investigators say the Syrian government's violence against protesters may amount to crimes against humanity. In a report, the UN investigators say they have found a pattern of human rights violations that constitute widespread and systematic attacks against the civilian population. Nearly 2,000 people are believed to have been killed and tens of thousands have been arrested since the crackdown began in March. In the latest assault, Syrian forces fired on parts of the port city of Latakia, killing dozens and driving some 5,000 Palestinian refugees from their camps. The UN Security Council is due to hold a special session on Syria later on Thursday. An emergency session of the UN Human Rights Council will be held on Monday following a request from all 24 members - including Jordan, Kuwait, Qatar and Saudi Arabia. "The secretary general expressed alarm at the latest reports of continued widespread violations of human rights and excessive use of force by Syrian security forces against civilians across Syria," the UN statement said. President Assad's reported announcement to the UN Secretary-General that all military and police operations against civilians have stopped, indicates that he can't totally ignore outside pressures and condemnation. Perhaps most telling has been the increasingly forceful warnings from influential northern neighbour Turkey that there has to be an immediate and unconditional stop to the violence. But the much-filmed army withdrawals from Hama, Deir al-Zour and Latakia in themselves make no real difference. There has so far been no sign that the regime's many other instruments of control are being stood down, such as the numerous unaccountable security outfits and the shabiha militia. So the track record suggests that the regime's latest moves don't signal a real change of heart, but rather, tactical manoeuvring aimed at riding out the latest wave of pressures while the struggle over the country's future continues. Mr Ban "emphasized that all military operations and mass arrests must cease immediately. President Assad said that the military and police operations had stopped," it added. The UN chief called on Damascus to introduce "credible" reforms and offer full co-operation to a UN human rights investigation into the crackdown. The UN said Mr Assad listed the reforms he planned to take, which included constitutional change and elections, while also agreeing to receive a UN humanitarian mission. The BBC's Jim Muir in Beirut says the Syrian authorities have staged highly-publicised troop withdrawals from three trouble-spots in the past couple of weeks - first the central city of Hama, then Deir al-Zour in the east, and now the Ramel district of Latakia on the western coast. But troops and tanks were pulled out only after they had done the job of restoring control by force, and there are many other instruments of security left behind to maintain the government's grip, he says. At this stage in the uprising, our correspondent adds, it is clear that if the regime really were to stand down all its many instruments of control - there are believed to be at least 17 different security organisations - large parts of the country would slide out of its grasp. President Bashar Assad came to power in 2000 following the death of his father, Hafez. He has responded to the challenge to his power with a combination of force and the promise of reforms, but has been unable to quell the revolt. Given what has been happening on the ground, neither Mr Assad's critics abroad nor the activists in Syria give much credence to the regime's ability to reform itself from within, our correspondent says. 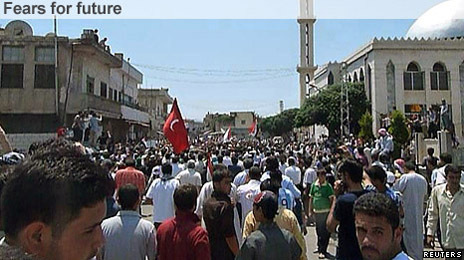 The unrest began following the toppling of Tunisian President Zine al-Abidine Ben Ali and Egyptian President Hosni Mubarak early this year.